11 A None No Power Seat 11 A is a standard Economy Class seat, however, this seat does not recline due to the Exit Row behind. 11 B None No Power Seat 11 B is a standard Economy Class seat, however, this seat does not recline due to the Exit Row behind. 11 C None No Power Seat 11 C is a standard Economy Class seat, however, this seat does not recline due to the Exit Row behind. 11 D None No Power Seat 11 D is a standard Economy Class seat, however, this seat does not recline due to the Exit Row behind. 12 A None No Power Seat 12 A is a standard Economy Class seat that JetBlue designates as an "Even More Space" seat. This seat offers an extra 7 inches of legroom compared to Core seats. There is an additional fee to book this seat. 12 B None No Power Seat 12 B is a standard Economy Class seat that JetBlue designates as an "Even More Space" seat. This seat offers an extra 7 inches of legroom compared to Core seats. There is an additional fee to book this seat. 12 C None No Power Seat 12 C is a standard Economy Class seat that JetBlue designates as an "Even More Space" seat. This seat offers an extra 7 inches of legroom compared to Core seats. There is an additional fee to book this seat. 12 D None No Power Seat 12 D is a standard Economy Class seat that JetBlue designates as an "Even More Space" seat. This seat offers an extra 7 inches of legroom compared to Core seats. There is an additional fee to book this seat. 13 A None No Power Seat 13 A is a standard Economy Class seat that JetBlue designates as an "Even More Space" seat. This seat offers an extra 7 inches of legroom compared to Core seats. This seat has a misaligned window. There is an additional fee to book this seat. 13 B None No Power Seat 13 B is a standard Economy Class seat that JetBlue designates as an "Even More Space" seat. This seat offers an extra 7 inches of legroom compared to Core seats. There is an additional fee to book this seat. 13 C None No Power Seat 13 C is a standard Economy Class seat that JetBlue designates as an "Even More Space" seat. This seat offers an extra 7 inches of legroom compared to Core seats. There is an additional fee to book this seat. 13 D None No Power Seat 13 D is a standard Economy Class seat that JetBlue designates as an "Even More Space" seat. This seat offers an extra 7 inches of legroom compared to Core seats. This seat has a misaligned window. There is an additional fee to book this seat. 14 A None No Power Seat 14 A is a standard Economy Class seat that JetBlue designates as an "Even More Space" seat. This seat offers an extra 7 inches of legroom compared to Core seats. There is an additional fee to book this seat. 14 B None No Power Seat 14 B is a standard Economy Class seat that JetBlue designates as an "Even More Space" seat. This seat offers an extra 7 inches of legroom compared to Core seats. There is an additional fee to book this seat. 14 C None No Power Seat 14 C is a standard Economy Class seat that JetBlue designates as an "Even More Space" seat. This seat offers an extra 7 inches of legroom compared to Core seats. There is an additional fee to book this seat. 14 D None No Power Seat 14 D is a standard Economy Class seat that JetBlue designates as an "Even More Space" seat. This seat offers an extra 7 inches of legroom compared to Core seats. There is an additional fee to book this seat. 15 A None No Power Seat 15 A is a standard Economy Class seat however there is a misaligned window at this row. 15 D None No Power Seat 15 D is a standard Economy Class seat however there is a misaligned window at this row. 16 A None No Power Seat 16 A is a standard Economy Class seat however there is a misaligned window at this row. 16 D None No Power Seat 16 D is a standard Economy Class seat however there is a misaligned window at this row. 17 A None No Power Seat 17 A is a standard Economy Class seat however there is a misaligned window at this row. 17 D None No Power Seat 17 D is a standard Economy Class seat however there is a misaligned window at this row. 3 A None No Power Seat 3 A is a standard Economy Class seat that has a misaligned window. Each seat features 100+ channels of XM Satellite Radio. This new addition to the JetBlue fleet features leather seats and personal televisions at every seat. The Embraer 190 also has more under seat storage space than JetBlue's Airbus A320. JetBlue offers passengers the ability to upgrade to “Even More Space” seating. In addition to providing an extra 6 inches in seat pitch, JetBlue’s “Even More Space” provides passengers with early boarding privileges, early access to overhead bins, and a fast track through security (only available in select cities). “Even more Space” pricing varies by route length. These seats can be purchased from JetBlue directly at the time of booking or at check-in. Pricing will be dependent on duration of flight. GREAT seat! Window was perfectly in the center, seat is large, lots of leg room. There is no bar under the seats so it feels even more spacious. A/C was slightly far back but it worked well. Clean. I frequently take the last daily flight from JFK to ROC and much appreciate the legroom and comfort in these extra-room seats. Makes it easier to sleep when the plane is late, as it often is, particularly in the winter. Well worth a few extra bucks or points. Pretty good. I like the window view. Should not be an even more space seat. 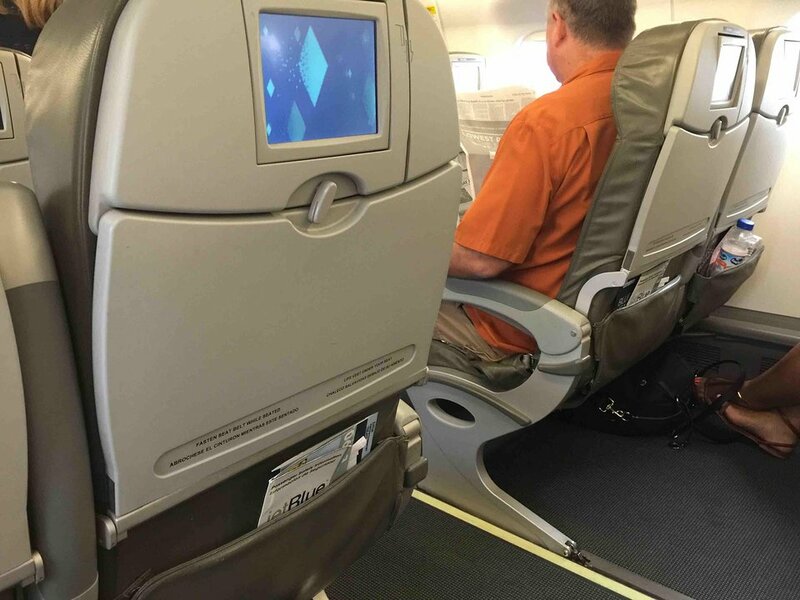 Although it is a bulkhead seat, the bulkhead runs right to the floor. If you have long legs, or big feet, do not sit here. Take an even more space further back in the plane. I just flew from MSY to BOS yesterday and we started the flight in 9A and 9B. Our seats got unbearably hot (hot enough to make us worry that something might have been wrong on the plane) and we were fortunate enough to be able to move to a pair of empty seats further up the weren't nearly as warm, although they did get uncomfortably warm during parts of the flight. I talked to a flight attendant and she talked to the pilot and they managed to get it a little cooler, but it didn't make a big difference. She said she just had trouble controlling the temperature on a different E190 a week ago, and part of the problem is that row 9 is right on the middle of the air conditioning systems so it gets warm when the ends of the plane are pretty cold. The moral of the story is don't panic if row 9 gets warm on an E190, and get a seat near either end of the plane of you're stuck on one. I'll be trying to avoid E190s in the future even if it costs me a decent chunk of money to do so. JetBlue will also be hearing about me about the heat problem, as their rep at the Just Ask desk we went to was completely useless and didn't even apologize. I flew the e190 from Laguardia to Boston Logan on the Jetblue shuttle. The seat width and legroom were great, and the 2-2 row configuration made for a comfortable flight. Boarding and deplaning went smoothly and we departed and arrived early. The in flight service was adequate for the short flight. Overall I was very happy with the service. There is news that the jetblue e190 fleet is under review due to the high cost of maintenance of these aircraft. I find the embraer e-jets comfortable compared to other short haul planes so I hope Jetblue sticks it out with embraer and gives the E2 generation of these aircraft a chance. I had a amazing flight! It was my first & last time fliying on the E190. I flew from NY to Nassau, Bahamas. I sat next to a stranger, since its 2x2 and we were a family of 3+ lap child. He was nice, stayed asleep for half the flight, which was only 2HR 51MINS. Legroom was great. Even better than the A320, in my opinion. I am a Frequent Flyer with Jetblue. I've only flown with TAM (Before the merge), American, and... Jetblue. We had a good flight plan. You should check the flight plan to check to check how long you'll have tv coverage. We flew along the US Coast, turning East from Miami. I think I saw Andrews AF Base! I thought it was Dulles Airport ???? This seat was very comfortable with no problems. We always get extra leg room on Delta, here we do not need it. As others have said this plane is awesome. Regular econ seats have plenty of legroom, snacks, drinks, tv, and wifi. I haven't found another carrier that comes close. I prefer the e190 to the Airbus planes that Jetblue has just because it's smaller which means boarding and deboarding is much faster. This aircraft is a very comfortable aircraft for domestic/regional routes. The aircraft is much nicer than the CRJ aircraft. The seats are very nice, and are not like the uncomfortable slimline seats offered in many other aircraft. Free wifi was nice, although Direct TV didn't work throughout the flight. I also really like how Jetblue gives you free bags of chips, even on such short flights. Comparatively, United gave us mints on a flight double the length. 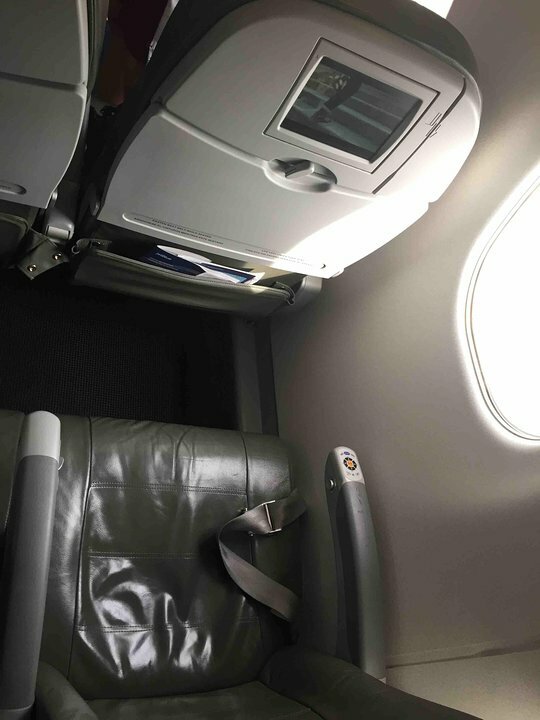 Seat 22L doesn't have a misaligned window. I would definitely recommend this aircraft when traveling regionally. Due to JetBlue boarding procedures (batches of 10 rows back to front) rows 2, 3, and 4 are the last to board, meaning there's a high possibility of having to store your carry on several rows behind you or having to gate check it. These are great planes - very comfortable, especially given the size. The seats are infinitely better than the slimline (hard plastic) seats United has been putting in and even without the "Even More Space," there was plenty of room. Cabin seems bright and airy and was clean. Loved having individual TVs and good snacks, which of course is pretty typical for JetBlue. The "misaligned" windows didn't bother me at all. Great seat. Aware the bulkhead area of this EVEN MORE space seating because there are only 4 more inches compare to the row 12~14 which has 7 more inches space. If you are an avgeek like myself, this is NOT the aircraft to be on. While the seats may be comfortable, EVERY window on this plane is misaligned, not just rows 15, 16, 17. 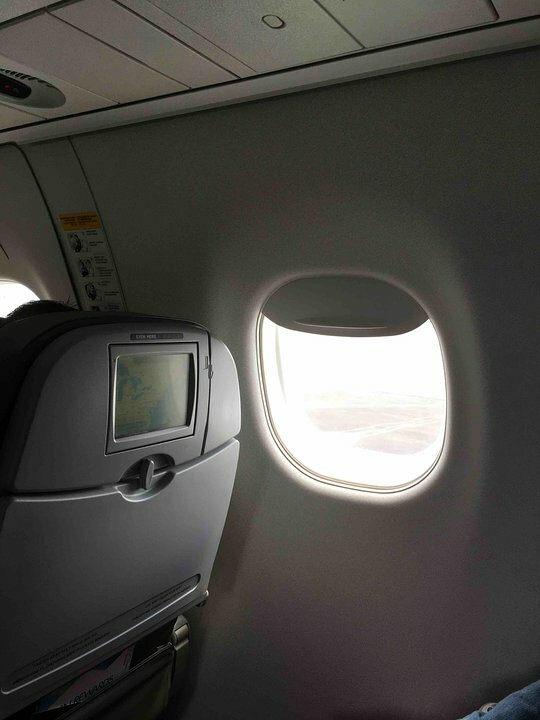 Although the windows are large, the seats them selves have the window set too far forward to even look to the left of you to watch out of them, let alone even try to take pixx or video. JetBlue should just realign the seats. I was very surprised by this plane and the legroom. It has WAYYYY more legroom than any plane I have been on. So good to see a plane with this much room. The even more legroom seats we upgraded to has as much legroom if not more than some first class seats. Even the regular seats had massive amounts of legroom. Kudos to Jetblue. The best standard seating on this excellent aircraft is row 2. All the under seat space as the rest of the plane, good window alignment, and better legroom than you'll find in any domestic carrier. Off the plane faster than everyone else but row 1 (which is not worth the extra cost). Plenty of room overhead for my carry-on and under the seat for my personal item. The under-seat space is not divided, making it easier to stash a backpack. Decently comfortable for a 2 hour flight, but I wouldn't want to be there for much longer. Plenty of leg room too! Great size plane. Rocks around in the wind a lot though. In my opinion, best, most comfortable plane in fleet. Strong performer. Pilots seem to like this aircraft. Love 2x2 seating. Ample leg room for my 6'1" frame. JetBlue has got it going on. Seats are comfortable and clean and there is plenty of foot space. My roller sits easily in the overhead without complaint. Crew is friendly and they serve Dunkin Donuts Coffee!! No complaints so far and I travel weekly from BOS to HOBBY and back. Planning on hitting MOSAIC soon..
My friend flew from Boston to Charlotte on this plane and was most impressed. Leg room and the quietness of it he said was magnificent. He said he would like to know who built this plane and where. There was plenty of legroom on this flight. There was so much, I can't imagine what Even More Space feels like. Great view of the wing, properly sized meals for short 1-2hr flights. I definitely suggest this plane for short flights. 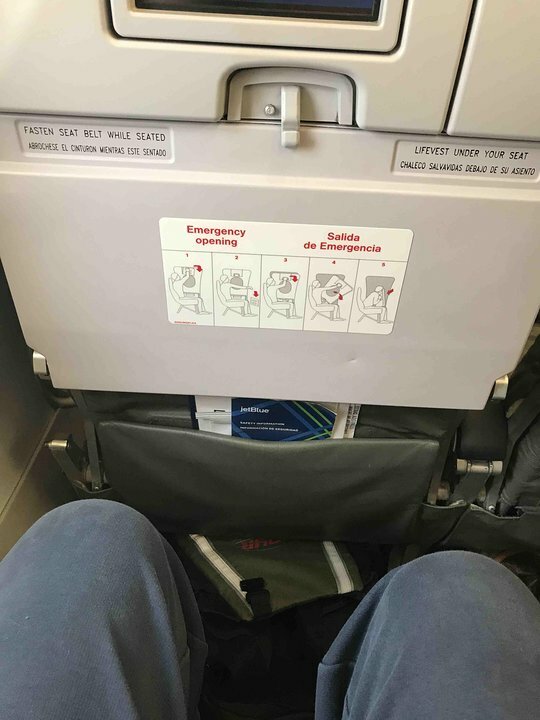 Let me start with I am 6'1" and leg room does not exist in coach on any airline. This regional jet has more room than most jets period. The 2x2 seating is great unless you are a party of three. As a semi frequent flier (aka someone that does not get upgraded) this aircraft is much better than most. The few times a year that I use the miles or get upgraded due to full aircraft business and first class is better. I say this to the people that complain about the leg room, you will not find much better in coach anywhere. We have had 3 R/T flights on these plane since January, 2015 with a 4th starting tomorrow. All have been in either row 1 or 14. The seats are extremely comfortable with much more than adequate legroom for my 6'1" frame. Big plane feel and comfort. Our 1st choice for air travel. Seat was horrible. It felt like I was sitting on soft cement. They definitely need to replace the cushions on this seat. I have flown this same flight 11 times round trip from Boston to Houston in the past 4.5 years. I LOVE JetBlue. The extra space seats are amazing. I am 5'6" and a plus sized person and i have LOTS or room. The free TV is a HUGE plus and the free snacks rock. i recommend this all the time. I think the bad comment is balony,this plane is NOT bad.I love the snacks and DIRECTV.Flight attendents were very helpful.Again the person who submitted the comment saying this plane is awful must not really like DIRECTV and sincere service. I love this plane! Since this plane has a 2-2 configuration I can have a window seat and my wife can have an isle seat and nobody else is in there with us. The seats are a little bit wider than standard airline seats with plenty of leg room. (I'm 5'11") We flew from Worcester MA. to Orlando.....a 2.5 hour flight and I was comfortable the whole time. The flight crew was wonderful, friendly, and helpful. All in all, a great flight. Depending on how much extra legroom you need this has a decent amount of extra room. I am 5'6". The middle arm rest does not go up. If you are on a night flight the blinding fluorescent light and clanking noise from the Galley area 95% of the flight is AWFUL if you want to rest/sleep. AWFUL!!! The entire 1st row was empty. Something others knew and I didn't. Wish someone had added this before I bought this ticket. Well, this flight was OK. Besides the hour delay, we were on or way with a smooth flight and good tasty snacks. Flight was reasonable, hope this helped! 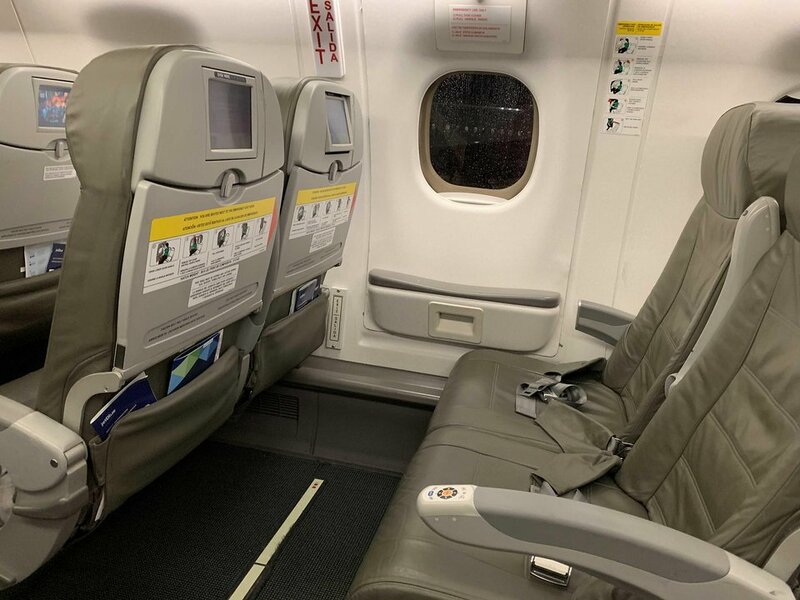 Quite comfortable for a smaller plane, the leg room is great even in no extra room seats thanks to no middle supports, allowing leg room and under seat storage. The retractable armrests are a nice feature on jetblue planes. I wouldn't recommend this seat to anyone because the recline is restricted because it is the seat in Front of the exit row and when you are traveling from New York to Fort Myers it gets uncomfortable after a while and when you walk in the cabin you feel like your in a big box. Jet Blue is a Great airline and i would recommend this airline to anyone but not the Embraer E-190 if you traveling say from New York to Boston then it wouldn't be bad taking that plane but not Long Distance. There's an armrest on the exit panel, so you do have an armrest. There's lots of space in this row. I'm 6'1" and my feet don't even reach under the seat in front so there's lots of room for storage. My standard carry on Travelpro fits in the overhead as long as I don't stuff it too thick where it needs the expansion zipper opened. Great plane since you also have no center seats. JetBlue flies 1 versions of Embraer 190.